/ Modified may 7, 2018 1:07 p.m.
Arizona Gov. Doug Ducey speaks to members of the media Oct. 4, 2017 on the University of Arizona campus. PHOENIX — Arizona Gov. Doug Ducey pointed to his record of growing the state budget without tax increases on Monday while teachers who went on a statewide walkout pushed a ballot proposal to hike taxes on high earners to fund schools. Last week, Ducey signed a $10.4 billion budget that begins to implement a 20 percent pay increase for teachers and adds $100 million in other funding. He said while the needs of support staff and classrooms also must be addressed, his pay raise plan will ultimately provide $1 billion for schools over several years without a tax increase. 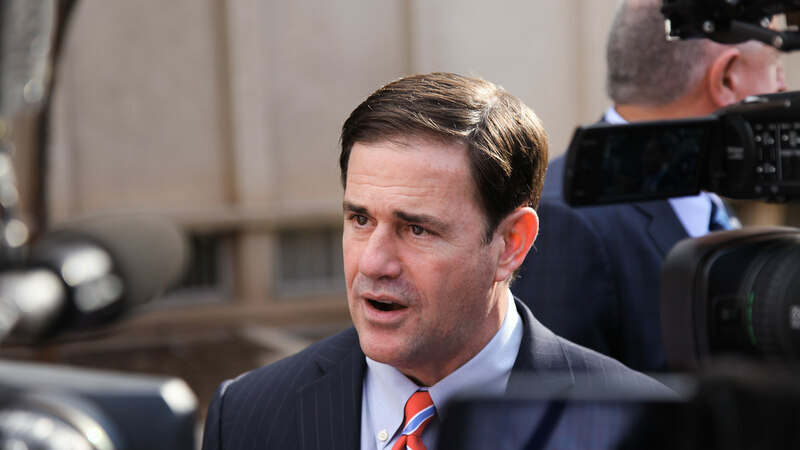 "There's more to do, but it was a very successful session," Ducey said. Educators held a six-day walkout that closed a majority of the state's school districts while demanding additional education funding. Strike supporters who said Ducey's plan didn't go far enough and didn't have a stable funding source have now turned their efforts to support a ballot initiative to raise taxes on high earners to fund public education. Some in the #RedforEd movement are gathering signatures. Backers of the proposal, called Invest in Education Act, say it would generate about $690 million. Ducey, who has pledged against raising taxes, wouldn't comment on the specifics of the plan. "I don't support tax increases," he said. "I think that government should find a way to live within its means." He said he's been able to increase the size of the state budget from a little over $9 billion to more than $10 billion since he took office without tax hikes because of the growth of the state's population and economy. "In the games of states, people vote with their feet, and Arizona's winning," he said. Ducey spoke to reporters after making a speech at the 20th annual Department of Public Safety Officer Memorial Ceremony. The event honors the 29 state troopers who died while serving since 1958. Officers and surviving family members laid single-stem roses on the stone memorial outside the Phoenix headquarters for DPS to the sound of bagpipes. "We must never take this sacrifice for granted, and we must never forget the families they left behind," Ducey said.